Won through a National RAIA sponsored competition, our commission was to design the $50M foundation medical school at University of Western Sydney. 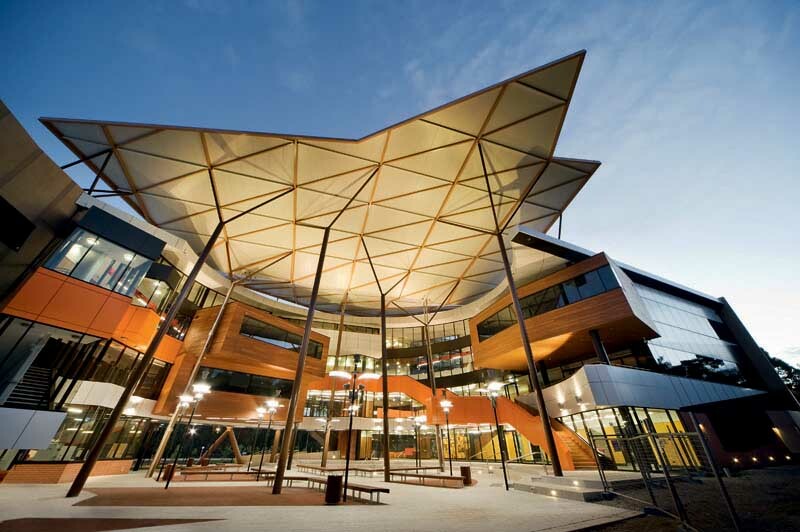 The new school, based at the Campbelltown campus in the heart of the rapidly expanding western suburbs, was briefed to be an integrated medical teaching and research environment based on the contemporary educational principles of student centred learning and collaborative interdisciplinary research. The University’s aim was to establish and contribute to a grass roots local and indigenous health service culture. The facility was to be an iconic gateway to the Campus, attracting keen students and the best postgraduate research and teaching staff – a proud institutional addition to the western suburbs. The design also needed to fit in with the cream and terracotta brick modern ‘Tuscan village’ aesthetics of the existing campus. Consistent with the client’s educational objectives, our key idea was to create an iconic “socioeducational” external hub space. The hub space becomes another pivotal external space, joining with and extending the vocabulary of the other forum spaces dotted throughout the campus. This external room provides a focal point for the three different programmes (teaching labs, office accommodation and research laboratories) to discuss medicine. The strong visual and spatial interconnection of the curved link which forms the external room blurs the programme’s delineation, mixing researcher, educator and students. The curved link structure becomes a super-foyer, more classroom than corridor. This external room is covered with a tree-like canopy as an extension of the woodland to the north. Problem based learning pods clad in recycled timber are like cubby houses, providing home room identity for the students overlooking the hub. All spaces within the complex are highly interconnected with open generous stairs. Communication and sharing between staff and students is optimised. Teaching spaces are spacious and comfortable, displaying the latest digital learning technology. Laboratories are designed on a generic platform to allow for changing research needs. Whilst in plan the three programmes are articulated as separate forms connecting to the hub link, they are joined together formally under one roof structure sloping to the north, in a kind of articulated monumentality. The solid east and west walls of the modules are rendered similarly in precast ‘brick’ panels, coloured to match the campus palette, in contrast with the transparent north and south facades. The ‘gateway’ administration module is lifted off the ground to create a generous colonnade at the building entry encouraging access to the hub space for all entering the campus. The building is sited to take advantage of best practice solar orientation. High levels of natural lighting into all occupied spaces allows energy to be saved on artificial lights. Low energy modular airconditioning is used throughout, also providing occupant control, particularly within the offices. Rainwater is harvested and used.